This 2 sided Memory Mother & "Child" pendant can hold a tiny bit of cremains as well as up to 7 birthstone crystals. The sterling silver Memory Mother & "Child" pendant comes with an/18" sterling silver chain. The 14k gold Mother & "Child" pendant does not come w/chain. Pendant measures about 7/8" w x 1" h - Image is enlarged to show detail Also available in platinum. The back of the Memory Mother & Child is able to hold a tiny bit of cremains sealed in place with resin enamel. 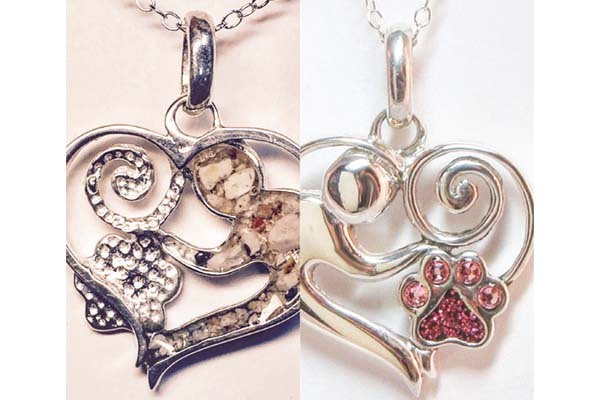 Only one Memory Heart Pendant is created by the artist at a time to insure that absolutely no cremains are mixed up or lost. This image has been enlarged to show detail. Memory pendants take about 1 week to complete. Only available in sterling silver at this time.